Lungscape is a translational research program designed, implemented and conducted by ETOP in collaboration with a series of leading hospitals and clinics across Europe and beyond. The program aims to address the challenges of studying the molecular epidemiology of lung cancer by coordinating and harmonizing the procedures of a group of lung cancer specialists working in translational research across Europe and allowing analysis of larger series of cases. This initiative has the potential to expedite knowledge of the prevalence and context of current and emerging molecular biomarkers with clinical significance and facilitate more rapid translation of biomarker knowledge to the clinic. The international collaborative effort provides a platform for molecular correlative studies and thus creates a basis for the development of clinical trials of novel therapeutics. Lungscape also aims to build comprehensive and practical diagnostic algorithms for personalized medicine in the clinic. 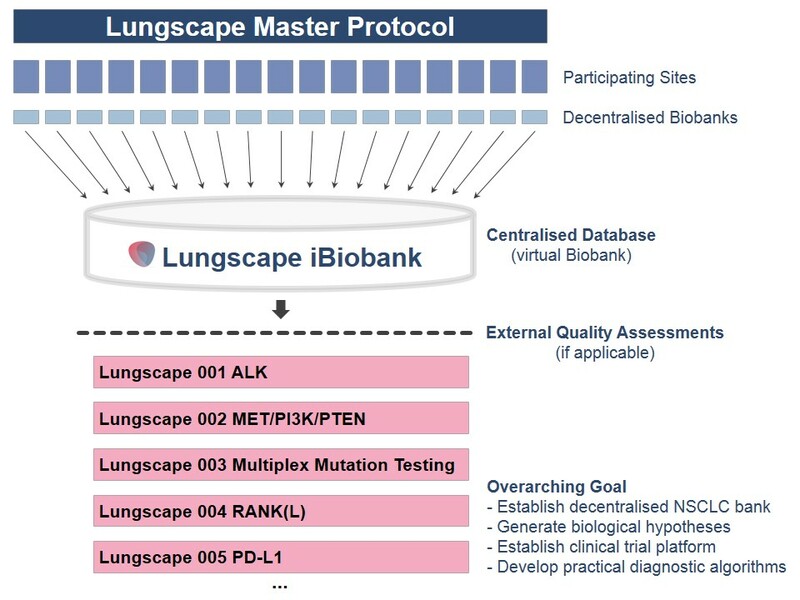 The fundamental approach of Lungscape was to build a decentralized biobank of samples from lung cancer patients with a completely documented diagnosis and treatment and at least three years of documented follow-up, including the availability of tumour blocks. The virtual nature of the iBiobank and the introduction of stringent standardized biomolecular assessments remove the need of transferring samples to a central location for evaluation. A central electronic database (ETOPdata) is used to store anonymised comprehensive molecular and clinical data and tracking biological material and derivatives thereof. The Lungscape Master protocol defines the setting in which specific hypotheses will be investigated. It describes the mode of cooperation of the participating investigators, the selection of documentation of the NSCLC cohort, laboratory requirements as well as the regulatory framework. Specific protocol modules then formulate a hypothesis to be investigated in the framework of Lungscape. A Retrospective Cohort Study of ALK gene rearrangement: prevalence and clinical outcomes in patients with non-small cell lung cancer in Europe. A retrospective cohort study of MET/PI3K/PTEN protein expression and MET/PI3K gene amplification: prevalence and clinical outcomes in patients with non-small cell lung cancer. A retrospective cohort study of multiple biomarkers by multiplex mutation testing: prevalence and clinical outcomes in patients with non-small cell lung cancer. A retrospective cohort study of RANK and RANKL prevalence and clinical outcomes in patients with non-small cell lung cancer. A retrospective cohort study of PD-L1 expression in patients with non-small cell lung cancer.